The project aims to develop a wireless neural prosthetic system made up of thousands of implantable microdevices that could deepen understanding of the brain and lead to new medical therapies. 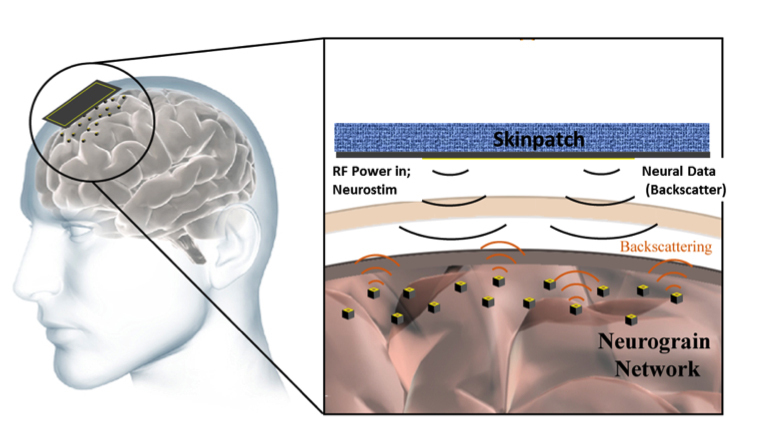 PROVIDENCE, R.I. [Brown University] — With a grant of up to $19 million from the Defense Advanced Research Projects Agency (DARPA), Brown University will lead a collaboration to develop a fully implantable wireless brain interface system able to record and stimulate neural activity with unprecedented detail and precision. The international team of engineers, neuroscientists and physicians involved in the project envisions an approach to neural interfaces that is unlike any available today. They aim to create a “cortical intranet” of tens of thousands of wireless micro-devices — each about the size of a grain of table salt — that can be safely implanted onto or into the cerebral cortex, the outer layer of the brain. The implants, dubbed “neurograins,” will operate independently, interfacing with the brain at the level of a single neuron. The activity of the devices will be coordinated wirelessly by a central communications hub in the form of a thin electronic patch worn on the skin or implanted beneath it. The system will be designed to have both “read-out” and “write-in” capabilities. It will be able to record neural activity, helping to deepen scientists’ understanding of how the brain processes stimuli from the outside world. It will also have the capability to stimulate neural activity through tiny electrical pulses, a function researchers hope to eventually use in human clinical research aimed at restoring brain function lost to injury or disease. At Brown, the work will build on decades of research in neuroengineering and brain-computer interfaces, computational neuroscience and clinical therapeutics through the Brown Institute for Brain Science, the University’s Warren Alpert Medical School and its School of Engineering. Four Brown faculty members will serve as co-investigators on the project. Leigh Hochberg is a professor of engineering and one of the leaders of the BrainGate consortium, which develops and tests brain-computer interfaces through ongoing human clinical trials. David Borton is an assistant professor of engineering who previously worked with Nurmikko to develop the first fully implantable brain sensor that could transmit information wirelessly. Larry Larson, Sorensen Family Dean of Engineering, is a leader in semiconductor microwave technology and wireless communication. Wilson Truccolo, an assistant professor of neuroscience, has developed unique theoretical and computational approaches to decoding and encoding neural signals from cortical microcircuits. Each will lend their expertise to the project alongside the team’s experts from leading institutions in the U.S. and abroad, with additional collaboration with companies such as software developer Intel Nervana. The new system will use microdevices to both "read out" and "write in" neural information. The project will involve many daunting technical challenges, Nurmikko said, which include completing development of the tiny neurograin sensors and coordinating their activity. Then there’s the challenge of dealing with all of the data the system produces. Current state-of-the-art brain-computer interfaces sample the activity of 100 or so neurons. For this project, the team wants to start at 1,000 neurons and build from there up to 100,000. The team will first apply new technologies to the sensory and auditory function in mammals. The level of detail expected from the neurograin system, the researchers say, should yield an entirely new level of understanding of sensory processes in the brain. The Brown-led team is one of six research teams to be awarded grants from DARPA under the NESD program, which was launched last year. Other awarded projects will be led by researchers at Columbia University, the Foundation for Vision and Understanding, John B. Pierce Laboratory, Paradromics and the University of California, Berkeley.